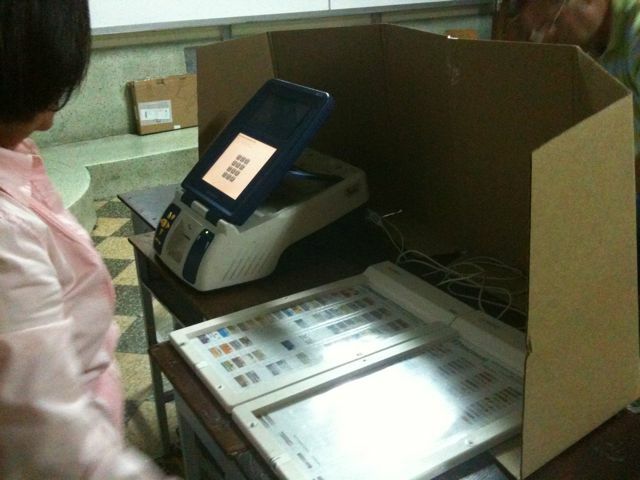 « All systems set: Vote, Democracy or…else! 8:05 PM Joy to the world! No audit for me! We now have to sign everything and pack up votes, results and materials and we are done!!! 6 PM it’ closing time, final tally 345 voters 62.18% of those eligible, for the full school the number is higher 64.1%. Order is to shut down if nobody in line. Witnesses walking in now en masse to view audits, 5 out of 8 tables in my center get audits. Hopefully mine does not, very tiring, ready to finish and go. Dont believe rumors, until tables are shut down a real estimate is alnost impossible. 5PM We are at 340, so we will be very close to 65%, 12 more voters in the last hour, some tables in my center have slightly higher percentages, others lower, this is just a little better than the 2009 referendum. 4 PM there has been no real pick up, only ten voters between 3 and 4 PM , we are at exatly 60 % we need to average 27 voters per hour in the last two hours to get to 70% lools tough, but people say it will pick up now based on experience. 328 at this time. 3 PM People clearly having lunch, it slowed down by now, small lines, we even had time to eat something . We are at 318 around 58% so far. Wish I had time to read about the outside world, this is very intense and tiring, but we still have hours to go. Rainibg now hard in Caracas. 1 pm: First big problem, voting machine jammed voter did not notice, voted twice. Nobody knew exactly what to do. One ballot is dropped in box, a report is written, the lines grows. Bummer. We had been very efficient. 250 voters at this time. That’ like 46% with five hours to go. Hungry! 11:00 AM We are up to 178 at this time, a slight acceleration. The bottleneck now is at the fingerprint machines. Howewer three of the eight machines were jammed when people pulled the ballot and are not working at this time. 9:00 AM so far 88 slow but faster, small lines, my mouth tastes like iodine from the ink. 8:24 am The biggest bottleneck is the machine, people sometimes fail to make all choices, other times they press twice and it erases the vote. Line is not big but once in a while people get confused and gets backed up. Funniest moment was a guy showed up to complain his father reappeared in the electoral registry, he would have been 127 years old. He wanted his protest registered. It was. 6:28 AM we have been ready a while but no voter has been allowed in, some heated discussionson how to manage lines, pro Chavez coordnator wants people to wait outside, we wantthem inside the school. Are they trying to slow down things? For the time being, I am in charge of ink ugh, fingerprint machine outside not working yet. 4:33 being intense i woke up early to blog, adrenaline flowing a bit sleepy right now. For comparison purposes my center had 33.4% abstention in the 2009 referendum, today there are 546 voters in the “table” I am working in. This entry was posted on	September 25, 2010 at 9:30 pm	and is filed under Venezuela. Thanks for your terrific continuous posting all day long (a very long day! ), and thanks for working at a voting table! You’re to be congratulated for doing great job as blogger AND as a Venezuelan citizen! Caracas Chronicles has been suffering problems all day from what I’ve seen. It has nothing to do with a comment about 52% of the vote. I think it is simply being overloaded. About 2 minutes after Caracas Chronicles web site posts a message that the opposition won 52% of the vote, the web site is down with a Internal Server 500 error. Coincidence or is it just because so many Venezuelans are searching the Internet for election news? Miguel, nice day to you, it works, so I watch it. Before I caught Globovisión thru la patilla pages…moctavio remarks are helpful. Thanks and nice dreams to him, after the well job done. There is a dawn in E. and the street life begins. Wery cold and rainy, at 2 Celsius. 1) Why did your last post come up “upside down” (i.e. when read “normally”, meaning from top to bottom, the post starts with you finally being able to have some rest at home after coming back from staffing the table, and ends with an update at 4.33am)? 2) I would have thought you’re a whisky guy. 3) Thanks so much for your updates through the day. Getting some rest while sipping some wine is well deserved. Thanks Miquel, I have followed you from Amazonas all day. Thanks for a good job and for keeping us updated. I was chosen at random. I voted when there was lull in my table and was able to go to Table 5 ( i was in 1) and vote. Because i was at a table I could bypass lines, but there was no need, the line was short. Bravo Miguel! Great work and thanks for the update. It has been very interesting following you. Now my questions: 1)how did you got chosen? 2) When did you vote? If you want to follow these elections you can at Justin TV on Venevision. can I ask you for help? Which studio can be seen online on PC, concerning Ven. elections? As I remember, the Chileans discussed it nonstop from north to south, but teleSUR informs me on Maduro opinions, but no reports from the very places (that Honduran did, too.) Thanks. If it disturb, forget it. How can the “best electoral system in the world” allow a voter to vote twice? Back from voting in Altamira. The queue was not long at all. One fingerprint machine was down. Otherwise voting was moving along at a good pace. On the way home, in Las Palmas, there was a huge queue, two or three hundred meters long, people lined up to vote. Just returned with my wife from voting in Valencia. Outside her centre there was a red toldo with PSUV reps. The people waiting to vote complained to Plan Republica who came out to look – but did nothing. A big group of people waiting to vote then got hold of the toldo and dragged it to the end of the street. Thanks so much for keeping us informed at this micro level. I’ll be watching yopur posts all day. I hope you are wearing gloves! that is a very mean ink. I had voted already at 8ish.. small lines. I don’t know what to think about it. Miguel, thanks for working at the polling station. I don’t think these workers are ever thanked enough. Over the years they have been gracious and helpful in every election I have taken part in and I only missed one since 1963, the previous one for the National Assembly (which I now realize was a mistake on my part). Today is a beautiful day for voting, bright and sunny! Just in case, I’ll take my wide brimmed Panama hat to keep the Sun out. My wife just informed me that she voted in Altagracia here in Margarita & it was a very fast process with no lines. This is a large Chavista area (Chavista mayor) so maybe that’s good news. The exit poll has the oppos ahead but it’s way too early. The lord of the ink! As the kids say… this is going to be epic. Enjoying your posts – have a great day! My wife is just leaving to vote (I can’t being a foreigner). We looked over the voting information earlier this week. I got to say that it’s really confusing until you sit down & figure it out. I can’t imagine many of the older people & less educated ever figuring it out or understanding it. I don’t know if that’s a help or not.